Libretto by Francesco Maria Piave, based on the play La Dame aux Camélias by Alexandre Dumas, fils. I attended the third night of this revival, Friday, September 19, and enjoyed the performance far more than I had expected. 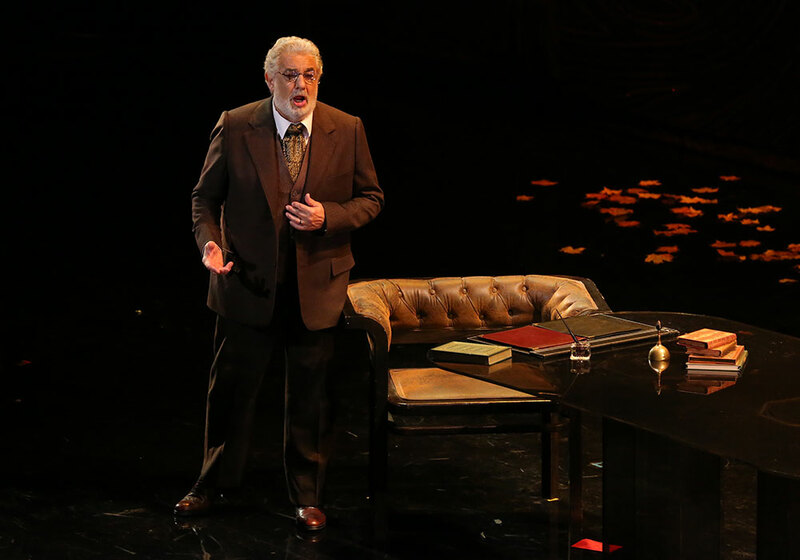 There is no question that Los Angeles Opera’s general director Plácido Domingo is a living legend and that he has been one of the greatest tenors to walk the earth, but I am not overjoyed by his apparent determination to reboot a portion of his multifaceted career as a baritone. In addition to being a conductor and impresario, he has undertaken the roles of Simon Boccanegra, Rigoletto, Athanaël (Massenet’s Thaïs), Doge Foscari (Verdi’s I due Foscari), Nabucco, and now the elder Germont in this La traviata. Alhough his name is a big and perhaps extremely important box-office draw, I would prefer he leave these roles to younger artists with fresher voices. And yet, and yet — his presence on stage Friday was one of the few truly moving aspects of an otherwise fairly routine event. Domingo carries such authority and has such wonderful stage presence, that many other considerations fly out the window. Certainly the voice is not as glorious as it once was, but you can still discern what was glorious about it. And he’s such an old pro and so thoroughly venerable that he is somehow right for the part. I never look forward to Germont’s aria, “Di Provenza il mar.” It’s a pretty tune, but it slows down the drama drastically. This time the aria became part of the artist’s life and career — and it was touching. As Verdi’s doomed courtesan, Violetta Valéry, soprano Nino Machaidze displayed a sumptuous voice and the kind of physical beauty that must be the envy of many a prima donna, but there was none of the inspired passion that can burn itself into the hearts and memories of jaded opera-goers who have heard La traviata a million times. And her Alfredo, tenor Arturo Chacón-Cruz, despite his fine voice, lovely technique and his having been groomed for the part by Domingo himself, could not quite break out of the prison of merely looking the part with an assemblage of spirited though clichéd operatic gestures. This 2005 Operalia winner already has a major career, but his distinctive vocal timbre takes getting used to on first hearing. Perhaps that is the reason he did not make a strong impression. 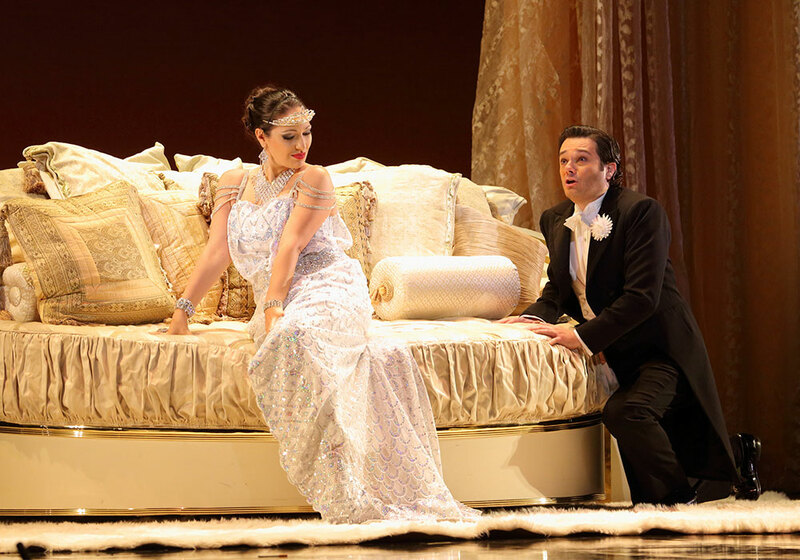 This is Marta Domingo’s show, the art-deco Traviata seen here before. Her costumes are attractive and the sets ditto, although they are awfully corny in conception. The final act places a lonely divan amongst the multitudinous stars of a kitsch empyrean, and the second scene of Act Two is set in a cobwebbed casino, the better for some enormous spider to devour all the sinners within. Autumn leaves romantically color the the first scene of Act Two. But the silliest bit is the red-light district lamppost we all must contemplate during Verdi’s beautiful orchestral prelude in which the composer intended to prefigure the romantic love affair and final death of Violetta. A street scene with prostitutes picking up johns? This goes greatly against the grain of actual history and the fictional legends of grand courtesans. The masterful ensemble finale of Act Two, after all, revolves about Alfredo’s treating Violetta like a whore by throwing money at her. Someone who knows opera thoroughly — like Marta Domingo, for heaven’s sake! — should not distort and confuse things. Even the gypsies and bullfighters of the second-act ballets are turned into animated Erté illustrations with seemingly no connection to the lyrics of the accompanying choruses. The dancers are delightful, however, and Kitty McNamee’s choreoography is great fun. Male soloist Evan Swenson looks nothing like a toreador, but is smashing nonetheless. Grant Gershon’s chorus comes though admirably as usual, and conductor James Conlon is totally on the money with the score. It’s nice to see talented mezzo-soprano Peabody Southwell as Flora, however small the role, and bass Solomon Howard makes a strong impression as Doctor Grenvil in his brief appearance at the end of the last act. And good work is also done by the roster of singers listed below.